October 4: Local motorists on L Street have been frustrated with a menacing pot hole that has grown increasingly dangerous in the past several months. Two local residents finally had enough, and found an innovative way to fix the problem. 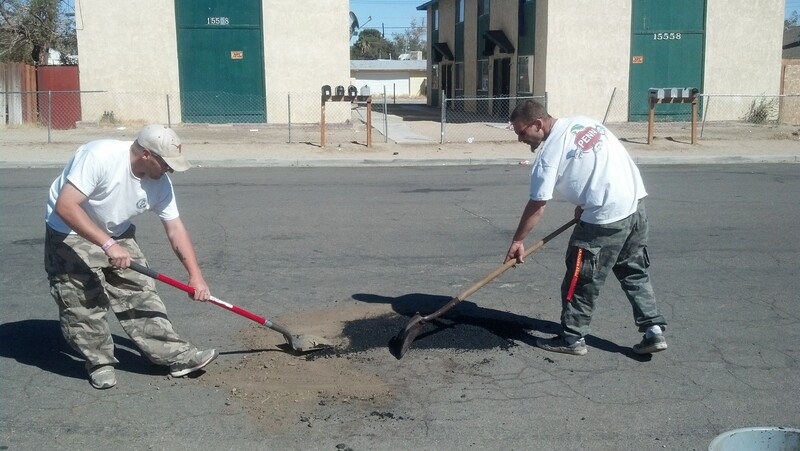 They found a construction crew repaving another parking lot in town, and managed to scrounge several buckets of asphalt. They loaded the black stuff into a garbage can, transported it over to L Street and filled in the pothole by hand! Shawn and Casey, pictured above, have been living in Mojave for years, and are trying to make the community a safer, more attractive place to live. “We all have to work together and keep an eye out for each other” said Shawn, 30. “Some people just don’t know how to do things the right way” said Casey, 38, as he carefully puts the finishing touches on the final layer of asphalt. The Mojave Foundation commends this kind of selfless service, and is proud to highlight this next generation of can-do residents. This entry was posted in Beautification, Cleaning up, Selfless Service, Uncategorized on October 4, 2013 by mojavefoundation.